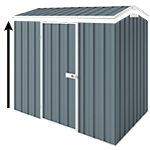 The Basic Garden Shed is a great value for your money, while you still getting the exceptional Absco quality. An excellent solution for narrow areas as this shed has the door on the shorter side. Designed for maximum strength and manufactured low maintenance ribbed steel. Door is hinged for added security. Engineered to withstand winds of up to the wind rating of N2 (147km/h). For permanent secure installation of your Economy garden shed, it is recommended to use anchors. To secure the wall panels to the concrete slab you will need 12 anchors for this shed. Hi there,Can you put the door on the RHS - instead of the LHS, as is on the image?Thanks,Joe. Timber Flooring Kit (3) to substitute concrete slab. Made from 100% Australian renewable plantation grown timber. Comes with 10 Years Warranty.